* Aduana Stars FC has signed central defender John Ashong from AshantiGold SC. Ashong scored a debut goal when Aduana Stars FC won 2-1 away against Wa All Stars FC, apparently a . Ashong will most likely form a strong defensive partnership with Emmanuel Akuoko this season. * Experienced striker Alex Asamoah (born 16.01.1986), who scored one goal for AshantiGold SC last season, made his debut for Aduana Stars FC against Wa All Stars FC. Asamoah was substituted for youngster Daniel Gozar, a talented striker, who turned out to score the matchwinning goal, apparently a beautiful solo effort. * Louis Agyemang (born 04.04.1983) scored a debut goal for AshantiGold SC against Real Tamale United FC. Agyemang, the powerful striker, starred for Medeama SC last season. Jonathan Quartey (born 02.06.1988), the central defender who played professionally at Kazier Chiefs FC (South Africa), OGC Nice (France) and Samsunspor (Turkey), also made his debut for AshantiGold SC against RTU. * Berekum Arsenal FC has signed experienced attacker Edmund Owusu Peprah, formerly of King Faisal Babes, Kessben FC and AshantiGold SC. Peprah scored a penalty goal against Ebusua Dwarfs. * Henry Yartey (born 12.10.1990) is the new goalkeeper at Berekum Arsenal FC. Yartey has mostly been a backup goalkeeper at Hearts of Oak SC. * Latif Salifu (born 01.08.1990), the pacy and skillful attacker at Berekum Chelsea FC, scored a debut goal against Heart of Lions FC, apparently a shot from about 25 meters. Salifu has been a star player for Liberty Professionals FC during the last five seasons. * Ebusua Dwarfs has made some interesting signings. Francis Morton, the talented left-back, has joined the club from Liberty Professionals FC. Morton’s corners, free-kicks and crosses with his excellent left foot will most likely become an important attacking weapon for Dwarfs. Dwarfs has signed two other players from Liberty Pros; defender Kwabena Twumasi and attacking midfielder Bright Lukeman. Newly signed attacker Asiwome Fumador starred at second level side Elmina Sharks FC last season. Ricky Adjei Mensah (born 10.02.1992), formerly of the Unistar Academy and Mighty Jets FC, is a new midfielder at Dwarfs. * Heart of Lions FC has signed several new players. John Abaidoo is most likely the former youth team player of Liberty Professionals FC. Kwame Bempong is most likely the former reserve team player of Medeama SC, born 07.11.1992. Bernard Morrison is apparently a talented striker. Based on their matchday squad against Berekum Chelsea FC, I believe Heart of Lions FC will struggle this season. They will benefit from getting enterprising striker Benjamin Fadi (born 16.03.1995) back from his commitments with the Ghana U-20 national football team. * According to trustworthy reports, central defender Nuru Sulley made a promising debut for Hearts of Oak SC. 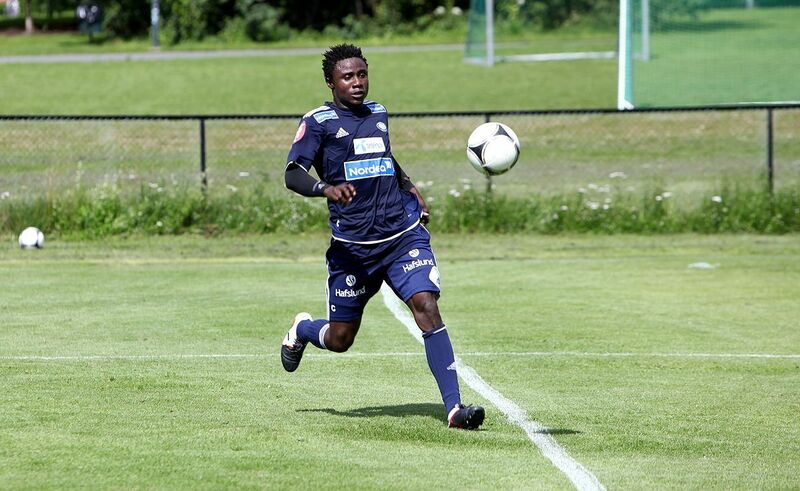 Sulley, who was a trialist at Vålerenga Fotball (Norway) this summer, was signed from Mighty Jets FC. The picture is of Sulley and was found on vif-fotball.no. * Iddrisu Moro, the hard-working and hard-tackling central midfielder of Hearts of Oak SC, formerly of Wa All Stars FC and Real Tamale United FC, is reportedly in top form. This is a player that should be watched for the upcoming season. * Goalkeeper Joseph Halm, signed from Tema Youth FC, could be heading for a great season at Medeama SC. Halm will face tough competition from Mozart Adjetey and Muntari Tagoe of the Ghana U-20 national football team. * New Edubiase United FC has signed Malik Tahiru, formerly of Liberty Professionals FC. The promising attacker was part of the Ghana U-17 national football team in 2008 and 2009. * In Aminu Mohammed, Real Tamale United FC has made a smart signing. Mohammed has made several impressive performances for AshantiGold SC during the last three seasons. Goalkeeper Collins Addo, signed from Berekum Chelsea FC, could also become a key player for the newly promoted side. Watch out for attackers Emmanuel Kwamena and Ahmed Salim Sakara; the former scored in his first ever top level match against AshantiGold SC. * Midfielder James Akaminko of Tema Youth FC is a player to watch. In March 2012, several independent sources revealed that Liverpool FC (England) was monitoring the player, who was 18 years old at the time. Akaminko made his top level debut on 10.10.2012 against Hearts of Oak SC. Apparently, Akaminko is a former player of Prampram Mighty Royals FC. * Francis Narh of Tema Youth FC is arguably one of the hottest strikers in Ghana at the moment. Narh scored for the Ghana U-20 national football team against Morocco U-20 on 07.10.2012 and scored yet again against Hearts of Oak SC on 10.10.2012. * Stephen Nyarko of Wa All Stars FC, an attacking midfielder playing for the Ghana U-17 national football team, scored a debut goal in his first ever top level match. Nyarko was signed from Deportivo FC, a second level side from Asokwa.